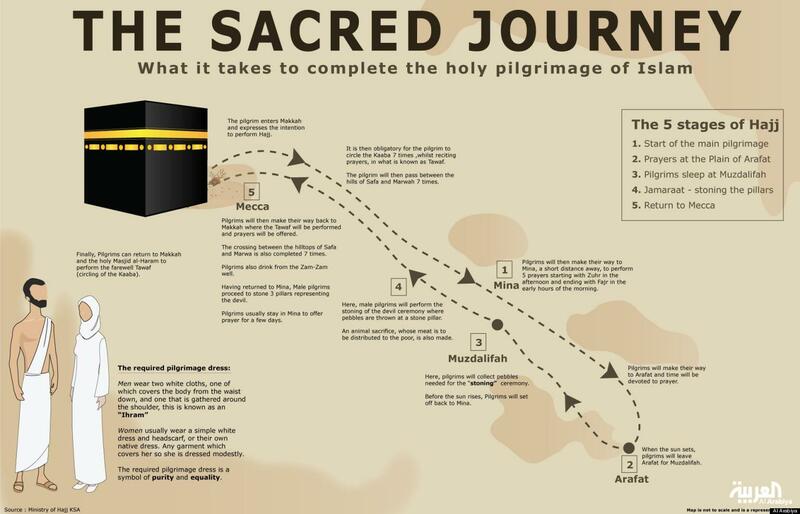 Hajj is the most sacred and the most desired journey for every Muslim. I am sharing with you some interesting insights, information and facts about Hajj or the Pilgrimage to Mecca. There has been a significant growth in the number of pilgrims that have been attending Mecca every year since 1996 (by 70%). Nonetheless there many more Muslims that wish to go for Hajj every year but are not able to make it due to limited visas or restriction by the Kingdom of Saudi Arabia. A very interesting chart illustrating the last years (2012) statistics of Pilgrims that attended for Hajj from across the globe and various measures that were undertaken by the Saudi government to serve the Pilgrims. This announcement reached each and every soul. This is the reason why hajees go to hajj replying to the call of Prophet Ibrahim saying “labbayk Allahumma labbayk”. Allah Almighty reminds us of the call of Ibrahim (Nida Ibrahim) in the Noble Quran (23:27). 3. All Prophets after Ibrahim alayhissalam performed Hajj. 5. Our Noble Prophet sallAllahu alayi wasallam performed many Hajj before and after proclamation of prophethood however he only performed one Fardh Hajj that was made obligatory in his shariah. 6. Hajj was made obligatory upon this ummah the 9th year of migration to Madina according to the most preferred opinion. (Rad al-Muhtar). 8. Our Noble Prohet sallAllahu alayhi wasallam did not perform Hajj that year. Imam Haskafi and others mentioned that He knew that He would live the year after (10th) to perform Hajj! (Durr Mukhtar) One reason was that he did not want to join Hajj whilst infidels were still in control. 9. Our Prophet sallAllahu alayhi wasallam performed only 1 fardh Hajj during his entire life, a few months before his demise in the 10th year of migration. It became known as the farewell hajj (hajjatul wada). Over 100,000 Muslims gathered at this historic event. Some even travelled from Yemen to attend. It is narrated in Sahih Muslim about this very Hajj that our Beloved Prophet distributed his hair among the companions. 11. Makkah is called Bakkah in the Quran (3:96) where the kabah is described as the first house placed by Allah Almighty for the worship of humankind. 12. It is narrated that before Prophet Adam upon him peace, there stood a building in the exact area of the kabah that was called ‘duraah’. It was lifted right above this area in the heavens and is also called albayt almamur. Albayt almamur is the kabah of angels on the seventh heaven where our Prophet alayhissalam met his grandfather Ibrahim alayhissalam on the night of ascention (meraj) who was reclining on the wall of albayt almamur. 15. The space directly above and directly below the building of the kabah is also a part of the kabah. Directly above it in the 7th heaven is the kabah of angels albayt almamur. 16. Therefore if somebody prays on the roof of the masjid or on a mountain, he would still be considered to be facing the kabah though the building would be below. However it is disliked in the Hanafi School to go to the roof of the masjid alharam (for tawaf or salah) and all mosques without necessity. 15. If someone prayed salah inside the kabah, he can face any direction as he would be facing the kabah anyway. 16. The area of hateem (external wall around the kabah to one side) is also called Hijr Ismail. It is narrated the Prophet Ismail and his blessed mother Hajir are buries here. In fact there is a narration that this is the resting place of 70 Prophets. This area is a part of the original foundation of the kabah so whoever prayers in this area in fact is praying inside the Kabah. is the Kabah, the house of Allah almighty. 19. On the day of Eid al-Adha when every Muslim is parying eid salah, the Haji in Mina does not pray eid. There is no eid prayer for the haji. 20. There is a fardh of Hajj that if were not performed by the magrib time of the 12th of Dhulhijjah can be performed at anytime of one’s lifetime. In other words, one fardh of hajj can be performed outside the months of Hajj: that is Tawaf al-Ziyara. 21. If however a married person did not perform tawaf alziyarah and returned home, physical relation with his wife would remain haram upon him until he does not return to Makkah and perform this tawaf, even if that is after 20 years! So make sure that you do not miss this tawaf if you are married! of Haram) but all of its surrounding area (called “hill” in Arabic) also is honourable. Now imagine the honour of the peice of land where the kabah itself stands.